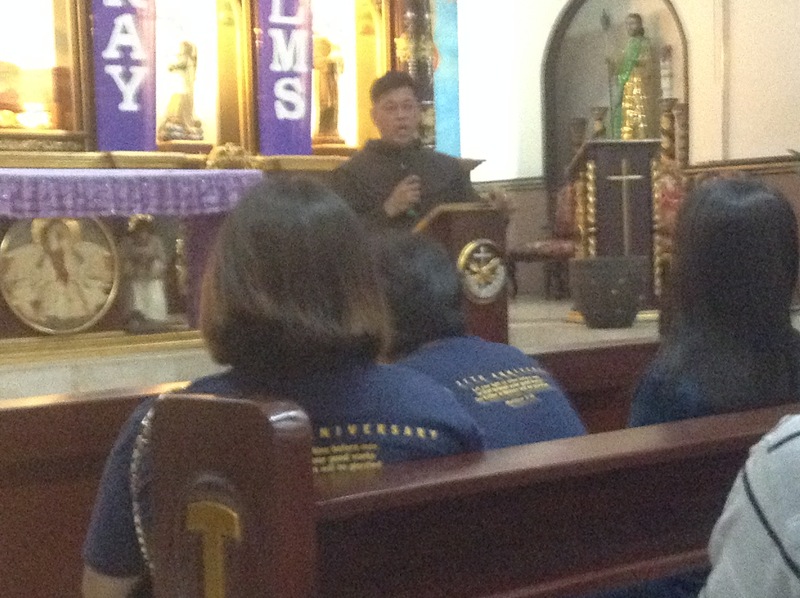 “KONTI LANG TAYO,” said he (pertaining to the meager number of warm bodies that came to Mary the Queen Parish last Wednesday night) “pero di bale.” And Monsignor Romulo Raňada beckoned the San Isidro Labrador Parish contingent to leave their host’s corner and join us to enlarge the austere (compared to the previous) crowd in the church while we awaited the coming of those who may have been caught in traffic. At exactly 7:23 pm, when the audience swelled to 101, he started by ascertaining if the meaning of 7Ps was still fresh in the minds of the attendees. One by one, as he moved customarily around, he asked each PREX person what every P stood for. Evidently, not all knew them by heart (one man was even wearing a t-shirt imprinted with it; I myself admit that, until that night, I could not recite them confidently properly) but by repetition, I knew that, if he conducted a review in April, more reassuring recitations will emerge (I knew I’m going to be prepared for it). Therefore, pagpupuri, pagsamba, pag-aaral, pagninilay, pag-e-ebanghelyo, paglilingkod sa Panginoon (greatest P of all) were effectively ensconced in the minds of his rapt audience. Happily, he shared that the monthly 7Ps is now 3 years going on 4. It is a worthwhile exercise done individually which becomes better if conducted together. Communitarian, the support it generates, because “sama-sama, ay lumalakas, laluna sa pagtaas ng mga petisyon”. The 7Ps monthly serves as a refreshing review for Lent and Easter, Monsi offered. Already on its third week, the preparation assures that God’s resurrection is ours, too. It is a privilege, he said, to “ipagdiwang ang pagkabuhay at mabuhay tayong muli”. Instead of the beach and Boracay, which can easily come after we have already faithfully observed the tradition or, if it really can’t be helped, we can go to church where we are, renew our baptismal promises there, now that we’re no longer infants and aware of the vows our parents made, and do it on their behalf this time (I liked that he said the holy interval beats Christmas like, 40 days of solemnity versus a year-long hysteria) because, in merely a short period, we recall on Ash Wednesday where we come from and return, and repent and change in heart, mind and soul. Like PREX. Which is only a weekender, but is an important way to change because faith is a relationship with the triune God and one another, explains why Jesus is number 1, the others number 2 and the self the last number. PREX also made us no longer “Hoy,” “Pssst,” or the like because, now, we are already “Ates at Kuyas,” and the first-ever song that we learned welcomes us to the family. If change is faithful, said Monsi, it trickles down faithfully for, without faith, there is no change, no giving, no understanding, because giving during PREX does not end there. During PREX, when one gives, one also forgives, a deed that is done even before it is asked for (as in fore-give). PREX taught us to treat God as Lord, unlike bashers and blasphemers who not only take Him for granted but also make Him a mockery (kasi diyos lang Siya, hindi Panginoon, ayon sa kanila). Before PREX, we had closed minds, hearts, hands and pockets; during the Weekend, those minds, hearts, hands and pockets opened, trickled down because, Monsi posited, when it’s hard to love neighbors, we try to treat them as enemies, or employ metanoia. When this happens, we’re ready for Easter, the grace of salvation, and resurrection with Him. The Sacrament of reconciliation makes Lent a clean, cleansed and worthwhile channel through Easter, it makes our eyes see clearly what used to be closed, dark and hidden, and forgiveness easier to give. 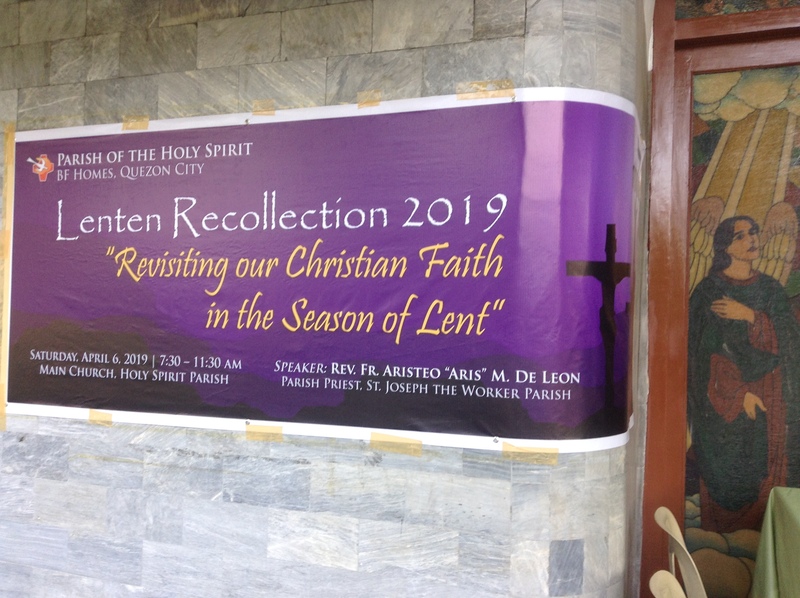 In conclusion, he enjoined PREX people to treat Lent seriously by leaving the dark past and going towards the light of Christ, an Easter present and presence. Then he blessed us. In the name of the Father, Son and Holy Spirit. Amen.